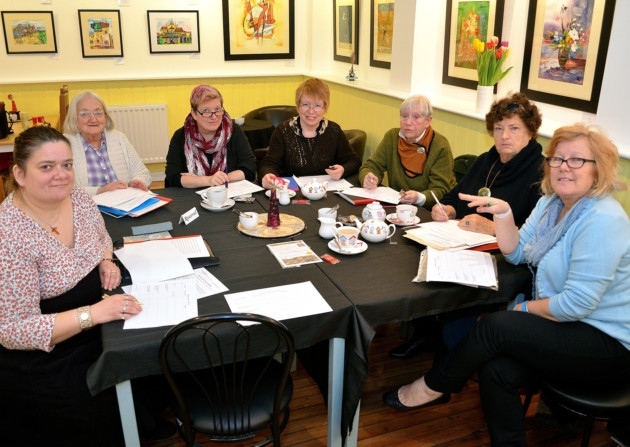 The first meeting as members of the Waveney Author Group (WAG) was on Jan 24th 2015. The writers devised their own individual WAG plans which had a step by step process on what they had to do in order to get published, the date they wanted to be published by and what support they needed from the Get Writing tutors. It was decided that they wanted to be published in time for the 1st East Anglian Author event/Pop-up bookshop that Get Writing were running at The Coconut Loft in July. The Lowestoft Journal came and took this lovely photo (and gave them a good write up in its paper). Writers: Helen Thwaites, Enid Thwaites, Jo Wilde, Pam Finch, Carole Gomez-Cornejo and Suzan Collins. After eating cake and devising the WAG plans the group agreed to meet monthly and the next meeting would be at The Cut at Halesworth. This entry was posted in Waveney Author Group and tagged 1st East Anglain Author event, Halesworth, Helen Meneghello, Helen Thwaites, Jo Wilde, Lowestoft Journal, Pam Finch, The Cut, Waveney Author Group, Writing. Bookmark the permalink.